Two Australian police officers have described the moment they jumped into the sea to rescue a drowning kangaroo. Sergeants Christopher Russo and Kirby Tonkin dragged the unconscious animal out of the water and performed chest compressions to revive it. The kangaroo is now recovering after the dramatic rescue in the Mornington Peninsula area, south of Melbourne. Sgt Tonkin said it was a “good feeling”, adding “every life is worth saving and we just did what we could”. The incident happened in the late afternoon on Saturday. Local resident Mia Grant saw the kangaroo bounce across the road towards Safety Beach. “I saw him swimming and started filming but he suddenly got caught in the backwash of the waves so we got him out and waited for police,” she told Australian media. 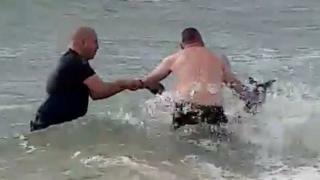 But the exhausted animal became spooked and leapt back into the sea – this time with the two officers in hot pursuit. “He had less than a minute… he went under and as he came up you could see foam coming out of his nose. He was drowning,” Sgt Russo explained. Ms Grant praised the officers’ actions. “You see a lot of bad things and to see someone so instantaneously race in after an animal gives you faith in humanity,” she said. The kangaroo was taken to the local police station, before being picked up by wildlife services. “We will let him recover at his own pace but he has a paddock full of grass and lots of water to drink and he seems very happy with that,” said Michelle Thomas, director of the local Animalia Wildlife Shelter.